Hail, hail, Freedonia! The Marx Brothers — (from the left) Zeppo, Chico, Harpo, and Groucho — declare war with a bang and a song in the anarchic musical comedy Duck Soup. S. – The uber-famous Marx Brothers have managed to seep into my consciousness without any active effort on my part. Up until 18 months ago I could have told you there were four of them and confidently picked two of them out of a line-up. Since the J. and S. joint household sprung into existence, however, not too many days pass without a Marx Brothers-inspired incident and thanks to Duck Soup I occasionally know what is going on. But the film was intended as a comedy (rather than a public service announcement for my benefit) and that is good because it is very funny. No attempt is made to tell a coherent story, rather a number of elaborate scenarios are constructed within which the brothers Marx proceed to inject chaos. No-one is safe from the shenanigans. Groucho, Chico and the psychotically menacing Harpo are willing, able and determined to make fun of whoever crosses their path. Chief among their victims is the wealthy widow Mrs. Teasdale (Margaret Dumont) whose ability to overlook the insanity being unleashed under her nose is remarkable and makes her a wonderful foil for the fast-talking Firefly. Zeppo is the odd man out, I suppose that is no surprise being the straight-guy, but among a massive cast of straight-guys it doesn’t really seem necessary. J. – I think you’ve made it pretty obvious, S., that I am something of a Marx Brothers fanatic. My dad introduced my brothers and me to a lot of classic comedy from the 1930s when we were kids, and it definitely made a big impression on us. I’m going to try my best to not incessantly pepper this yammer with Marx Brothers quotes, but I fear I’ve been vaccinated with a phonograph needle. I’ve seen the first seven Marx Brothers films countless times over the last 25 years, and I think it can be said with absolute certainty that Duck Soup is their finest (Vi-a-duck? Vi-a-no-chicken?). The Brothers have a unique comedic sensibility that relies on speed and chaos, and because Duck Soup is stripped of Marx-less subplots the movie is allowed to careen about at will. The movie positively delights in being absurd and preposterous, starting with the idea that Groucho would be made the head of a small nation. At no point are his qualifications given and he is such an unpredictable and abrasive insult machine that he becomes a more and more preposterous choice for leader every minute. The joy of the film is that it revels in the ridiculous and its juxtaposition with the standard rules of polite society. For instance, the first five minutes of Duck Soup (and it’s a short film) don’t contain a single joke. The country of Freedonia is established for the audience and so are all of the straight men who will be tormented by the Marxes for the rest of the film. The setting is grand in a 1930s movie set kind of way, and a musical number begins in the vein of spectacles of the day and… nothing — Rufus T. Firefly has overslept. His alarm blaring, Groucho finally wakes up and slides down a fireman’s pole into the proceedings — wait, why is there a pole? ah, who cares. — and proceeds to verbally abuse everyone in sight with insults, bad puns, insulting bad puns, and wild non-sequitors (“Jamison, take a letter to my dentist…”). The aura of elegance and statesmanship set up by the film is figuratively burned to the ground in seconds. S. – This is big budget comedy. The sets are elaborate, and in some scenes (such as the ballroom reception and the Freedonia cabinet meeting) the cast is massive with all the players beautifully dressed. Such attention to detail adds to the sense of the ridiculous as Firefly and the bumbling spies set about their revelry without a care for their surrounds. I do like that this is not just about class-bashing, the working stiffs are just as vulnerable as wealthy widows and ambassadors to be poked fun at, insulted and have items of their clothing snipped off or set alight, usually before they have registered that something is not quite right. From the moment the Marx Brothers hit the screen a break-neck pace is set, especially with regard to Groucho’s rapid fire gags. I am sure that multiple viewings will continue to reveal missed moments of hilarity. 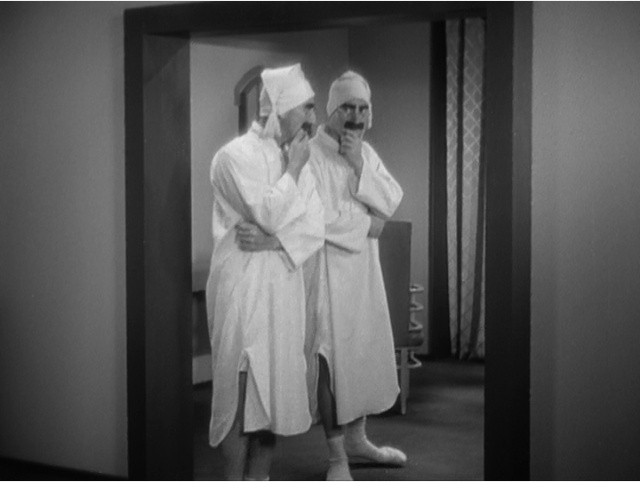 One of my favourite scenes occurs when Groucho, Chico and Harpo are all dressed in nightgowns and caps sneaking around Mrs. Teasdale’s house after dark. The physical comedy as Harpo and Groucho face off as a mirror-image is brilliant and boring details such as where the broken mirror went and why it was even there at all are blatantly ignored. J. – The mirror scene is one of the truly classic bits in this film, and I think goes a long way to demonstrating the impact of the Marx Brothers on future comedy, particularly with regard to animation. I find it hard to believe that the anarchic spirit of the Looney Tunes of the late 30s and 40s would have been possible without the model laid out by the Marxes (certainly having characters mirror each other is done in cartoons all the time). I too like that the film is not really a snobs versus slobs thing — a hallmark of American film comedies that I mentioned in our previous yammer for Trouble in Paradise (1932). Trouble in Paradise avoids that trope by sticking almost entirely with the privileged classes and using witty repartee and innuendo to get its laughs. The Marxes,however, go after everyone, regardless of their social standing, and one of my favorite bits is the escalating conflict between Chico and Harpo (posing as peanut vendors) and the streetcorner lemonade seller (played by comedy veteran Edgar Kennedy). The torment they put Kennedy through is perhaps the greatest slow burn in all of film. In general the Marxes are just insane. Groucho is all verbal intensity, making cheap jokes at everyone’s expense: “Remember, you’re fighting for this woman’s honor, which is probably more than she ever did.” He delights in utter nonsense and is always the most shabbily dressed among his peers, whom he treats with contempt. Chico is a barrel of malapropisms, mangling the English language to make some of the worst (and consequently best) jokes ever and constantly getting enraged at his mute partner. Harpo never says a word and is pretty much a surrealist nightmare in human form. A dervish of destruction, he’s probably stolen your wallet, cut your hat in half, and set something on fire before you even realize what happened. What’s important to note is that there’s no reason for the jokes. In silent comedy, for example, the gags are typically the result of elaborate set ups — sequences of cause and effect — but in Duck Soup the Marxes basically do and say whatever they want, circumstances be damned. But all of this craziness demands excellent straight men, which in the Marxes’ case is typically a straight woman — Margaret Dumont. Years later Groucho would claim that the regal Dumont (who is in several of the Marxes’ movies) was so excellent in her role because she never understood the jokes. True or not, Dumont’s performance as Mrs. Teasdale is remarkable and she is the perfect recipient of Groucho’s insults and romantic advances (often in the same breath: “Married. I can see you right now in the kitchen, bending over a hot stove. But I can’t see the stove.”). Poor Edgar Kennedy. Hats are swapped, blows traded, and tempers are flared as Chico and Harpo antagonize, confuse, and exasperate a rival street vendor. The elaborate routine of torment is a perfect slow burn, escalating at just the right pace and pitch. 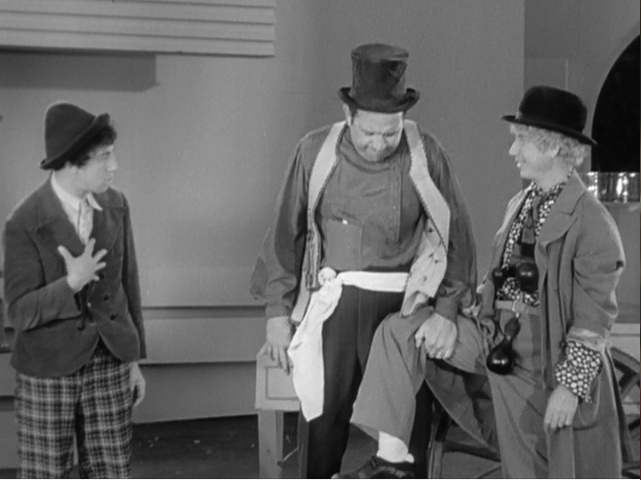 By this point, Kennedy has the wrong hat and is unwittingly holding Harpo’s leg (a favorite gag of the character). S. – Harpo is really quite scary, in an evil clown kind of way. His personal delight at cutting things with a hefty pair of scissors and smiling happily in the face of the frequently angry reaction I find quite disturbing. It makes me laugh but it also makes me want to slowly back away. Perhaps the most confronting aspect of the Marx Brothers’ comedy is that nothing is sacred. Here they are starring in a big budget movie production all the while gleefully tearing the art form to shreds. The complete disregard for narrative is at odds with the carefully detailed scenes constructed throughout and the many actors who populate them. It is like sketch comedy performed over the top of a series of other films that have been spliced together. In this way they get to poke fun at various movie genres including Hollywood musicals, courtroom drama and war films while exposing the idea of a movie reflecting reality as a flimsy pretence. It is audacious, irreverent, funny and confusing all at 100 miles per hour. Duck Soup goes completely bonkers in its final reel as war descends upon Freedonia. The uniforms make no sense, the house has turned into a 19th century stockaded fort for no reason, and help in the form of police, elephants, swimmers, and monkeys is on the way. J. – Duck Soup serves as a parody of politics through its skewering of governance, international relations, and the elitism of those in charge. It works as a war spoof, splicing together random elements from the American Revolution, the Alamo, and World War I into a nonsensical, hilarious mess. But I think it is first and foremost a parody of movies in general. The sketch comedy element you mentioned is definitely part of that, as many scenes have little relevance to the rest of the film — if it’s funny, it’s good enough. But I think the film is at its best when it really runs against movie conventions. The war scenes of the last act are a great example, as the film incorporates random stock film, baffling costume changes (Groucho’s outfit changes about five times at random and for no reason), and oddball humor (like a vase getting stuck on Groucho’s head and Harpo’s solution being to paint Groucho’s face on the vase). It’s also a blistering takedown of early movie musicals. (Interestingly, Duck Soup is the oldest musical on the Sight & Sound list, yet it is a parody of the form — I guess critics like movies that engage in criticism.) All of the songs in Duck Soup are jokes or setups to jokes, without a hint of earnestness in them. In the “We’re Going to War” musical number, for example, the massive choreographed room of extras are made to go through truly ludicrous group exercises in [intentionally] poor performance. It’s grand and completely stupid (see top photo). 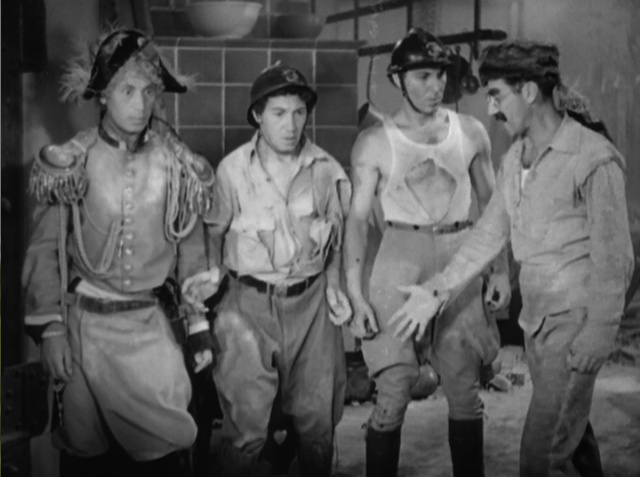 Hell, Duck Soup is so irreverent that it’s even a parody of Marx Brothers movies. The characters of the four brothers were well established in four previous films, which always included a piano performance by Chico and a solo harp performance by Harpo. 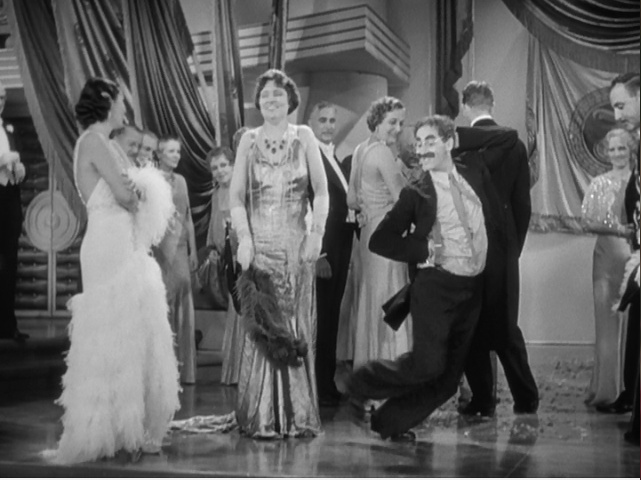 In Duck Soup, Chico is warned not to make a sound — as he crouches by a piano. The audience at the time would have immediately assumed a piano performance was coming — it doesn’t, it goes one better. Harpo begins plucking the piano strings like a harp — for about three seconds before the lid slams on his fingers. Performance over! The Marxes were smart enough to target themselves along with everyone else, and anarchy definitely works best when no one is safe. Now, go and never darken our towels again! We just really like this shot. 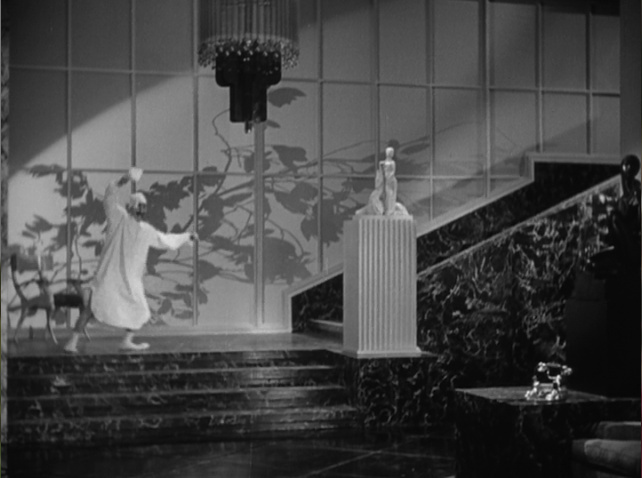 It goes to show that Duck Soup has great set designs and establishes itself within an apparent tradition of upperclass, sophisticated comedies like Trouble in Paradise, only to have a man in his nightshirt go skidding across the set in floppy socks.